Italian thinker and media activist Franco ‘Bifo’ Berardi is an important figure of today’s Leftist European theory. Having joined the Italian Communist Youth Federation in 1962 at the age of 14, he is often associated with the autonomist Anarcho-Marxist movements of the 1960s and 1970s, such as operaismo. He has developed theories and praxis that simultaneously confirm, challenge and expand on established modes of Marxist philosophy and aesthetics. His latest English-language book, written in direct response to the escalating financial crises of the last five years, proposes that poetry is a most effective form of opposition to the ruling classes’ doomed attempts at restoring capitalist ideology. And as ambitious and perhaps outrageous as this argument may appear, Berardi succeeds in making a compelling case for some of the key tenets of his thought-provoking thesis. Early on in the book, Berardi states that the aim of his essay is to subvert ‘the subjugation of the biopolitical sphere of affection and language to financial capitalism’. He begins his detailed and lively discussion of this subjugation by analysing the mechanics and dynamics of today’s late-capitalist, hyper-postmodern digitised milieu in which – on par with commodities being deprived of their use value and deformed into properly useless yet overvalued virtual signifiers – words are also emptied of actual referents and are turned into groundless, disembodied and ‘deregulated’ signs. When the relation between the signifier and the signified is no longer guaranteed by the presence of the body, my affective relation to the world starts to be disrupted. My relationship to the world becomes functional, operational – faster, if you will, but precarious. This is the point where precariousness starts. At the point of disconnection between the language and the body. Inside the precarious conditions of labour, collective breath is fragmented, submitted to the accelerating rhythms of the virtual machine: the fractal fragmentation of labour is parallel and complementary to the fractalisation of financial capital. Financial capitalism is deterritorialised and virtual, and acts as a constant recombination of virtual fragments of abstract ownership. Berardi is, however, rather vague apropos of how poetry is capable of re-territorialisation and opposing fragmentation. While this book includes a number of wonderfully robust and stimulating definitions of poetry – e.g. poetry ‘creates new pathways of signification and opens the way to a reactivation of the relation between sensibility and time’ or ‘poetry opens the doors of perception to singularity’ – it is also noticeably short on examples of a poetry capable of performing the patently difficult and paradoxical task of, on the one hand, representing/replicating ‘the infospheric pollution of the psychosphere’ and, on the hand, offering ‘a therapy treating the disturbed organism’. The only two poems quoted in the essay are by the popular early twentieth-century German-language poet Rainer Maria Rilke, an apt citation in so far as Rilke’s poetry is emotionally rich and, by and large, devoid of modernist fragmentation and abstraction. But is one to also conclude that, according to Berardi, the only kind of poetry capable of opposing capitalism is a mystical sonnet or elegy featuring angels and ancient myths? Berardi’s closing remarks on the efficacy of irony further complicate his argument. Whatever one’s view on Rilke’s poetry and the more recent New Ageist enthusiasms for his work, one would find it rather difficult to detect anything whatsoever ironic in the Bohemian-Austrian lyrist’s work. Furthermore, in the light of the recent and rather influential critiques of irony – by, among others, Slavoj Žižek and the late David Foster Wallace – I for one find it quite hard to get particularly excited about an artistic mode which is now the defining aesthetic of many a Hollywood comedy, Pixar cartoon and pay TV sitcom. 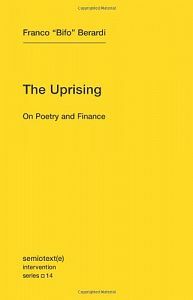 I feel, at any rate, very grateful for having read The Uprising: On Poetry and Finance. While Berardi leaves a number of questions (intentionally?) unanswered, he succeeds brilliantly in posing these questions and persuading us of their significance. He leaves one in little doubt over contemporary culture and cultural products’ role in alienating and sickening us both as their creators and their consumers, and he encourage us to imagine a poetry capable of reconnecting and curing us of the disease of capitalist ideology. Both he and his publishers – the indefatigable semiotext(e) – are to be congratulated for the creation of this very pertinent book. Thanks for that. Excellent review. Title duly noted. Rilke, and only Rilke? Beradi must be a phenomenologist first and foremost, but from where he appears to be coming from I took it as a given that what is lost on the theoretical semiotic swings is regained on the more praxic marxian roundabouts. Even Roland Barthes, in his last book on photography, renounced theory in favour of structures of feeling based in referents, where Rilke no longer cut it for him. So taking one of the terms of the postmodern malaise you mention – fluidity – photography is the base for much digitised fluidity, where millions of pixels are continually being cut up and respliced and reimaged in abstraction from referents; not unlike the economic fluidity of many recent, Neoliberal, first world economies, where with globalisation there was simply too much fluidity, too much cash floating around, increasingly more money chasing goods and services, so for not so liquid referents (houses etc) debt was continuously being packaged and spliced and diced and repackaged before finally being downloaded onto the disenfranchised, until no one knew what anything was actually worth and the economic system caved in. Poetry and finance? 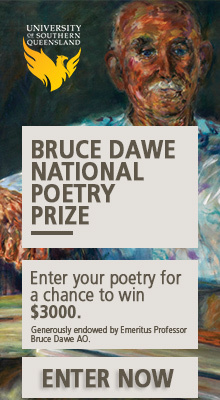 It’s not hard to see where a lot of contemporary poetry is coming from; and perhaps, where it needs to be redirected?